With a declining membership the money starved SSF were struggling to finance competing in the European Surfing Federation. The SSF needed to go professional to support such financial demands therefore it required more members and more sponsorship. The SSF couldn’t afford it and had a choice to go the route of Ireland surfing and welcome the likes of Guinness as the sports backers and its mainstream popularity or say no and withdraw. Sam Christopherson, the SSF president at the time, proposed the the various options in 1999 at the AGM and the overall consensus at the time by the members was that the sport would benefit from further development on a local basis. 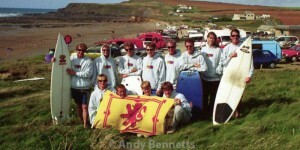 Indeed between 1999 and 2005 the wave of change came and the sport of surfing developed growing significantly at each of the main Scottish Surfing destinations. Influences through the UK media, surf competitions, surf videos, surf photos, surf shops, surf schools, surf clubs, surf websites, surf guides, better wetsuits, word of mouth and probably the biggest advance the internet prompted accelerated growth albeit there just has no organization guiding its growth nationally. By late 2004 given the growth that had been seen and lack of national direction it wasn’t long before surfers from areas such as Thurso, Fraserburgh and Edinburgh once again began to review the status of the SSF and investigating the possibility of whether it may be restarted.